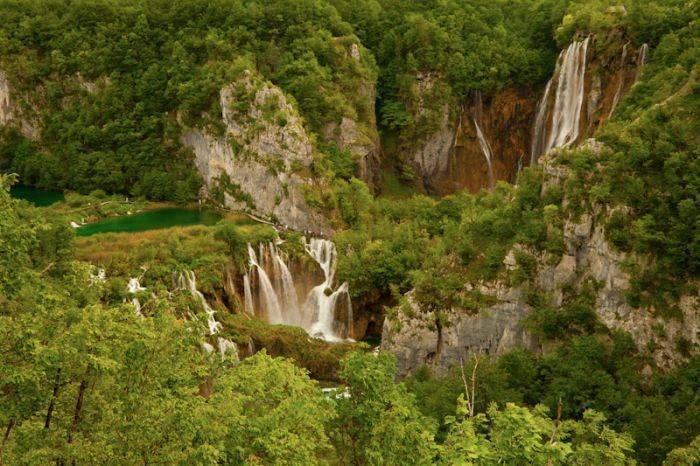 The villa is located in Hodak Croatia in place Seliste Dreznicko, near the National Park Plitvice Lakes. We want to offer you an accommodation for those visiting the Plitvice Lakes or are on a journey through the Adriatic coast. If you want to stay here longer, provides for you a lot of sights in the town and surrounding Rakovica. Villa Hodak verfügt über 3 Dreibettzimmer und ein Apartment. Im Apartment befinden sich 5 Betten und eine Küche. Jedes Zimmer, so wie das Apartment auch, verfügen über ein eigenes Badezimmer. Für alle Gäste besteht die Möglichkeit ein Frühstück zu bekommen, was wir extra berechnen. Die Gemeinde Rakovica befindet sich im südlichsten Teil des Komitas von Karlovac, in Nähe des nationalparks Plitvicer Seen. Sie umfaßt 26 Ortschaften an den Ufern des Flusses Korana, der nach den Plitvicer Seen und Wasserfällen weiterfließt und unterirdische Seen in Nova Kršlja bildet, wobei er auch das wirtschaftliche und soziale Leben der Gemeinden Plitvicer Seen und Rakovica verbindet. Durch Rakovica führt die Hauptverkehrsstraße von Zagreb über Karlovac und die Plitvizer Seen bis Adria mit der Abzwigung nach Bihać in der Föderation Bosnien in Herzegowina. Hodak Villa is located in the village Seliste Dreznicko, community Rakovica beside the main road D-1. If you are coming from Zagreb on the D-1 through Karlovac and the Plitvice, you will need about 2 hours to our lodging, and just 2 km further, there are "Plitvice lakes". If you are coming from Split on the D-1, then you need to Plitvice via the bridge over the river Korana and after 1 km you will arrive at our facility. If you take the A-1 motorway from Zagreb, Karlovac, you can switch to the D-1 and continue towards us. Or continue on the highway to Otocac, then on the main road D-52 direction Vrhovina and Plitvice. If you take the A-1 motorway from Split and Zadar, exit the highway in Gornja Ploca and go over Korenica and Plitvice next to us. For tourists who take the bus, the bus stop is 100 meters away from our house in the village Seliste Dreznicko.